TMG Reporter 2.1 features detailed Activity Reports, Scheduled Custom Reports, Comprehensive Filtering and more! 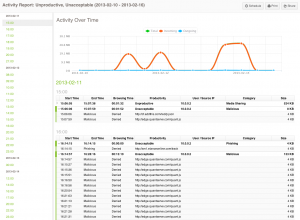 Activity Reports provide a chronological list of all activity showing full URLs and timestamps. Step through daily web browsing activity and expand sites to view full URLs, categories and actions. Click the Activity Report button on the Reports tab to get started. Schedule any report and email it to the right person. Send the Marketing manager an unproductive browsing report for their department every week, or receive an automated daily email of the day’s top threats. 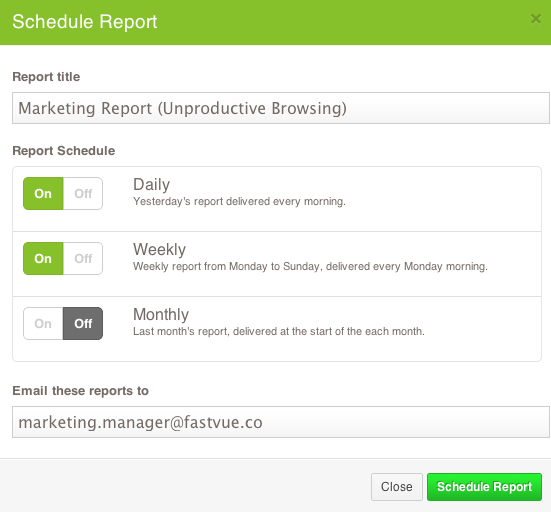 Click the clock button on the Reports tab to get started. Report on exactly what you need with the new filtering interface. Run reports on unacceptable browsing in the marketing department (yeah, we like to pick on the marketing folks! ), but don’t include Web Ads or blocked traffic. Click the Filter button on the Reports tab to get started. 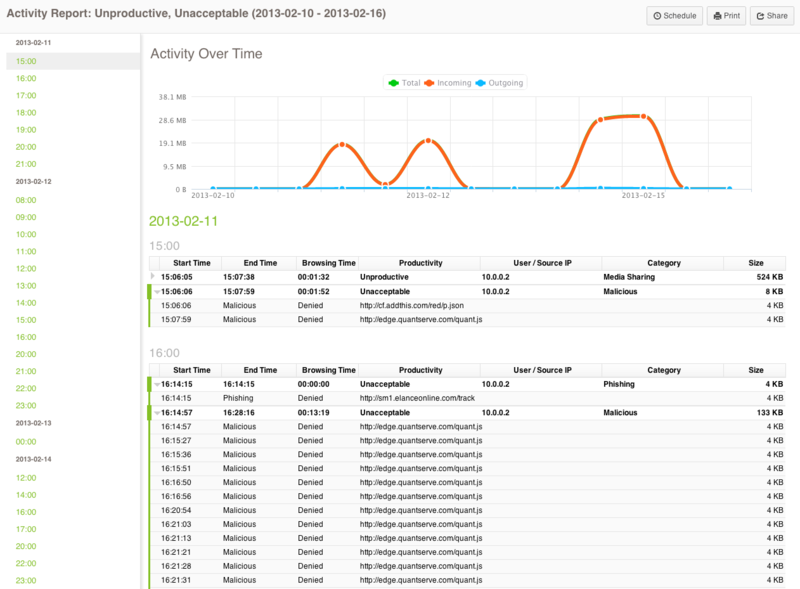 Drilldown on activity by launching new reports while keeping the existing filters. 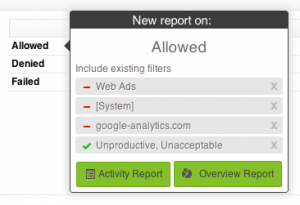 Create a report filtered by Unproductive browsing, and then drilldown into ‘Allowed’ traffic while keeping your unproductive filter. Hover over the magic green arrow that appears in reports to get started. 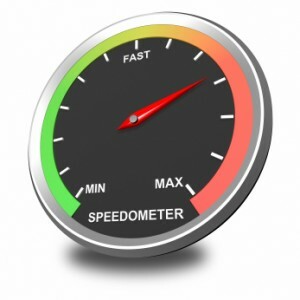 TMG Reporter 2.1 generates reports almost twice as fast as version 2.0 and uses less memory. 2.1 also comes with a long list of minor bug fixes and tweaks making the overall experience even smoother. 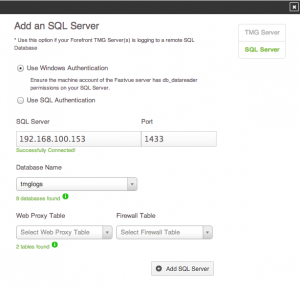 If you have configured Forefront TMG to log to a remote SQL database (there are some great reasons to do so), you can now import directly from the database. No need for the Fastvue Arbiter! 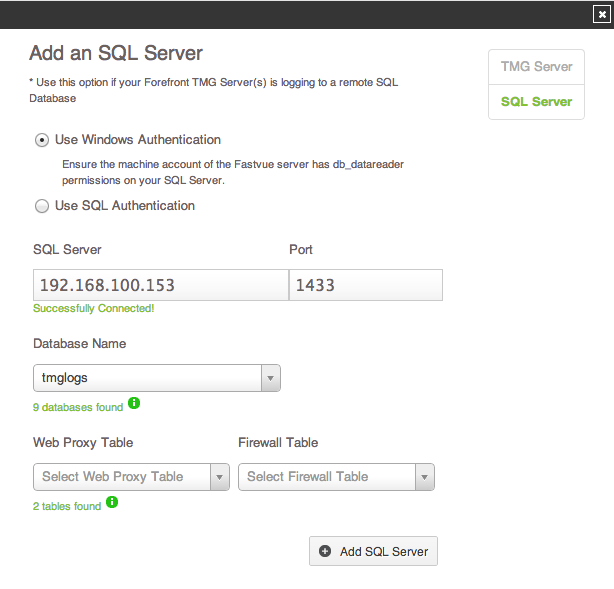 Go to Settings | Sources | Add Source | SQL Server to get started. TMG Reporter installs and configures all the prerequisites (IIS and .NET 3.5) on Windows Server 2012 and Windows 8. Upgrading to TMG Reporter 2.1 is free for anyone with an active subscription to TMG Reporter. Otherwise, all pricing information can be found on our Pricing Page. Can I upgrade without losing data? Yes, absolutely. Just run the new TMG Reporter installer over the top of your existing installation. Your existing settings will be picked up by the installer, so just hit next throughout the wizard without changing any settings. Once the installer has completed, head to the site and clear your browser cache (ctrl + F5, or cmd + R on Mac). You can then run reports on all your previously imported data. Note: The Dashboard and Alerts screens will be reset, and will start rebuilding as new data is imported. Do I need to upgrade the Fastvue Arbiter? If you are running a relatively recent build of TMG Reporter (2.0.1.14 or above), then you do not need to upgrade the Arbiter on your TMG Server. No changes have been made to the Arbiter since July 2012. How many chickens do I need to stack to reach the moon? You’ll need about 1,164,848,484 chickens. We won’t stack chickens for you, but we’re more than happy to help with any questions or issues related to TMG Reporter. Get in touch at support.fastvue.co. We’re here to help.